This is a lighting technique that was shown to me by LVicari. I have wanted to try this for some time and now was the right opportunity. The sky was right, the models and location were available. I had initially intended on using the stallion in the photo but he wasn't on his best behaviour that day so we went with one of the fillies, unfortunately she shied everytime the flashes fired so I only got three photos...this was the last. Due to Leo not putting up many lighting tutorials (please let me know if I am not aware of any in the tutorials), I have included a link to one of his explanations. Here is a layout more like what he had explained to me for outdoor portraits. You can find plenty of layouts in his portfolio. The layout he explained to me was in a private thread...so it was on the net but not public. This is just TOO COOL to comment. LOVELY, WONDERFUL and INTERESTING. This is a 10! I love this, Judi!! Very, very nice, congratulations! Great job on the ribbon, Judi. Love this one!! Wow, love this shot. Congrats on the red. Way to go. I spotted her right off. Well done. "Aw mum do I HAVE to wear that thing"....congrats! Well done Judi -- not just the special lighting but the entire composition. I don't know what to say, seriously. Absolutely astonishing! From corner to corner, top to bottom, and side to side the lighting has made every element in your photograph pop with WOW Factor. Judi!!!!!!!! Fantabulous! Congrats on a well-deserved ribbon. I'm seriously amazed you got ANY shots with the horse, using strobes! I did a pet portrait with a horse, and I couldn't even use a reflector. Made the horse VERY nervous. Amazing you pulled this off, to such spectacular results. Congratulations Judi. What a wonderful and dramatic shot. Gorgeous models too. Wow! powerful and beautiful! Congratulations on your ribbon!! COOL! My prediction was right,Judi! nicely done. Hang a ribbon on this one! Fantastic. Congratulations Judi, very convincing lighting setup, I love the result. Very nice Judi... glad to see you in a Top Spot! certainly moody. definitely outdoor. well done. Can't wait to find out more on this. I see a very blue ribbon sticked on this work. 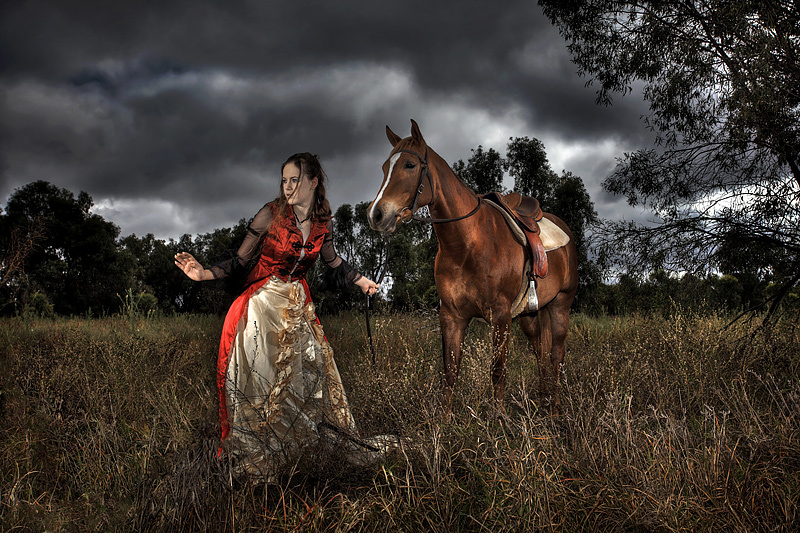 This is seriously COOL... all the elements I love, mood, horse, victorian dress, Clouds! Gotta go google Moody outdoor lighting!! Really lovely image. Lighting is fabulous. Looks over sharpened though - I'll review again on other monitors. Proudly hosted by Sargasso Networks. Current Server Time: 04/23/2019 12:00:31 PM EDT.